We are a group of over thirty Methodist Churches serving communities within the Gwent area of South Wales in the British Isles. 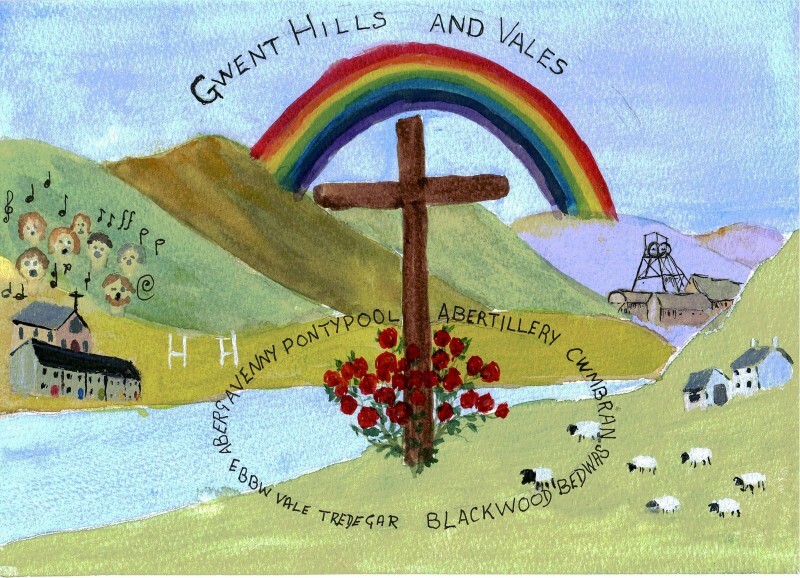 The Gwent Hills and Vales Circuit (Charity Number 1140255) is part of the Wales Synod of the Methodist Church of Great Britain. It was formed from an amalgamation of the Abergavenny, Abertillary, Blackwood, Cwmbran, Ebbw Vale & Tredegar, and Pontypool Circuits, together with Bedwas Methodist Church from the Caerphilly Circuit. The Methodist Church is one of the largest Christian churches serving Great Britain, with nearly 265,000 members and regular contact with over 800,000 people. It has about 5,800 churches in Great Britain, and also maintains links with other Methodist churches totalling a worldwide membership of 70 million. The calling of the Methodist Church is to respond to the Good News of God’s love in Christ and to live out its discipleship in worship and mission. In worship Methodists give thanks to God who loves us and has set us in this world of possibilities. Methodist worship is characterised by a lively tradition of hymn singing and a passionate regard for preaching the love and justice of the gospel of Jesus. Methodists believe in what John Wesley, Methodism’s founder, called ‘social holiness’. The longing for holiness is not about wanting to be ‘holier than thou’. It is about wanting the love of God to permeate all of our lives, and for that love to be shown through our lives to other people. Methodists embrace care for individuals and communities; involvement in education and development for all, in struggling for a just world, being alongside the poor, caring for the earth and getting to know other cultures and faiths. A priority of Methodists is to tell people about the Good News of Jesus and call them to faith and to Christian Discipleship (see ‘Our Calling’). Methodists have always believed that no one is beyond the reach of God’s love. Salvation is there for everyone who turns to God, and not just for a chosen few. It is a strong feature of Methodism that lay people (those who aren’t ordained) should play a major part in the running of the Church. A recent survey of Methodist congregations revealed that (from those who responded) three out of four individuals held some sort of church role. Worship each week is not always led by an ordained minister, but often by a local preacher – a lay person who has been trained and authorised to lead worship. At all levels of the Methodist Church lay people are involved in decision making. We celebrate our Methodist heritage and the impact the movement has had on the cultural landscape of Wales. We live in a fast-changing world, but we believe the central Christian message has not changed, from the time of Jesus right through to the present day. We endeavour to ensure that this message of Jesus Christ is relevant to new generations. 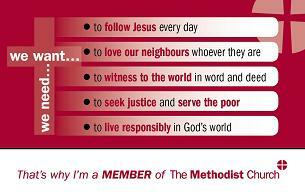 For more information about the Methodist Church, see the Methodist website, wikipedia, or check out the opening chapters of ‘Discipleship.. and the People Called Methodists’ by Martyn Atkins, former General Secretary of the Methodist Church in Great Britain. A free copy of the book can be downloaded here.